The San Diego Court Sports Association is a 501(c)(3) non-profit organization dedicated to the development and promotion of court sports in San Diego. For our purposes, the court sports include the net sports, like tennis, badminton and table tennis, and the enclosed court sports like squash, handball, and their variations. We use this website to share a large amount of information about these sports in San Diego. The Sports page is the most important routing point to learn more about the sports you are interested in and how to access these sports in San Diego: places to play, people to play with, local history of the sport, etc. We think court sports can significantly improve the quality and length of our lives, and to bring that about, the San Diego Court Sports Association's activities include tournaments, instruction, cross-sport play, connecting players to one another, helping you get the right gear, etc. The sports pages also help you find out where to go to find regular games, answering questions like "where do people go to play pickleball on Tuesday afternoons?" September 2018--Sponsored San Diego Table Tennis Association's Traveling Team. Shared the team's costs of participation in the LA Open. They had two quarterfinal finishes, and one finals finish. July 2018--Sponsored World Outdoor Racquetball Championships in Huntington Beach. Provided $1000 in prize money. June 2018--Padel Project. We are assisting America Padel and the Beach and Bay YMCA get people out to play padel ("Spanish Paddleball") on their brand new courts. June 2018--Charlie Brumfield's 70th birthday party. People came from all over the country for the celebration of the racquetball and paddleball Hall of Famer's big day, which included play at the PPA followed by a roast at San Diego Squash. May 2018--Travel cost sponsorship for San Diego Table Tennis Assoc. Traveling Team: SDTTA recently established a traveling team to play tournaments around the Southwest. SDCSA is providing a small sponsorship to defray travel costs. April 2018--Sponsored NPA National Doubles: The national doubles championship in paddleball. March 2018--Sponsored NPA Singles: The national singles championship in paddleball. Jan 2018--Cleanup at PPA: SDCSA volunteers spent a day scrubbing and polishing and trimming at the PPA, which was, in the 1970s, one of the most prestigious sports clubs around. It had become a bit scruffy. We cleaned it up. Jan 2018--Sponsored LA Open: A tier 1 pro stop which, for the first time, offered a paddleball division with $1000 going to the winners. Dec 2017--Holiday Toy Drive Racquetball Tournament: Raised $1000 for Monarch Schools, an organization that educates homeless children. Dec 2017--Holiday Toy Drive Paddleball Tournament: Raised another $1500 for Monarch Schools. SDCSA wants you to become a member. Membership affects our ability to deliver useful services. You don't have to be a member to play in our tournaments or access the court sports information we've put together to help you play in San Diego. That's available to everyone. But SDCSA membership gets you discounts on tournaments and instruction, as w vcell as discounts on gear. If you're a member, you can also sell gear you don't need on our Classifieds page. We also have some special member activities that we hope you'll enjoy. One kind of member activity we look forward to is field trips. Some of those will be local, like a field trip to Smash! Badminton in Mira Mesa to learn from their Head Coach and Olympic gold medalist Tony Gunawan. Tony is a rare kind of athlete because he has not only won an Olympic medal, he has also coached Olympic medalists and is an outstanding teacher, if a stickler for perfection. We are lucky to have him here in San Diego, and he is one reason Smash! has quickly become a badminton powerhouse at the national level, with its own traveling team. We hope that spending a little time with Tony, Pandu, Ali, and the other stars at Smash! will give a better appreciation for badminton regardless of how much experience you have. We are also introducing San Diego racket sports players to padel, a crazy variation on platform tennis. We've been waiting a long time for this! And the Pacific Beach YMCA on Ingraham has opened two world class padel courts. Padel has a net like tennis, but a smaller court like pickleball, and bouncy walls like racquetball, and the ball is played on the bounce. The long, fast rallies make padel one of the fastest growing sports in the world both for players and spectators. In Spain, where the sport began, it is second only to soccer in overall popularity, and it is not unusual for a serious match to draw a crowd of 10,000 fans! The Padel World Tour now spans four continents and includes a stop in the US. If you watch the video, you can't help but think it's cool. We also plan to take care of some of our local resources. There are lots of outdoor racquetball and tennis courts in San Diego that sit in a derelict condition waiting to be replaced by storage sheds or parking lots. We want to go into these courts, clean them up, hold a tournament, give a clinic, and return them to the community so that they can help keep people healthy for years to come. We've already given a good buff and polish to the PPA in Mission Valley. A good candidate for the next application of elbow grease is the old New York-style 1-wall facility at the North Park Recreation Center. Squash League, starts June 18, 2018, San Diego Squash. Your Monday nights will never be the same. Charlie Brumfield's 70th Birthday Party, June 9, 2018. A milestone for "the holder of all titles". San Diego's first padel courts open at the Pacific Beach YMCA, June 1. We have been waiting for something like this for a long time. Paddleball National Singles, March 2-4 2018, Tournament House, Riverside. The biggest paddleball annual paddleball singles competition in the world. Contact Aaron Embry or Todd Entriken for details. Dave Freeman Open Badmintion Tournament, February 23-25, Balboa Park Activity Center. One of the biggest badminton tournaments in the US. Fifteen courts going morning-to-night. Sun and Surf Squash Tournament, Feb 24-25, San Diego Squash. Various skill level divisions ranging from 3.0 to Open. Table Tennis Juniors, February, at ASLT (Sorrento Valley). Holiday Doubles, December 16, LAF Poway: Racquetball, bring a dish for potluck, bring a toy for needy kids. Contact Jacqueline Paraiso for more details. 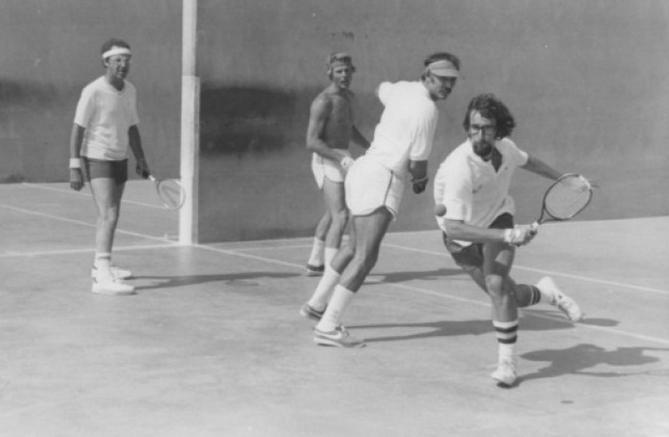 Pickleball Doubles, December 16, Bobby Riggs, Encinitas. Holiday Toy Drive: December 9, LAF Mira Mesa: Paddleall, grab bag doubles, partners will be drawn from a hat. Contact Aaron Embry, for details. SoCal Squash, November 10-12, San Diego Squash: A major tournament for players of all ages, genders, and levels of expertise.